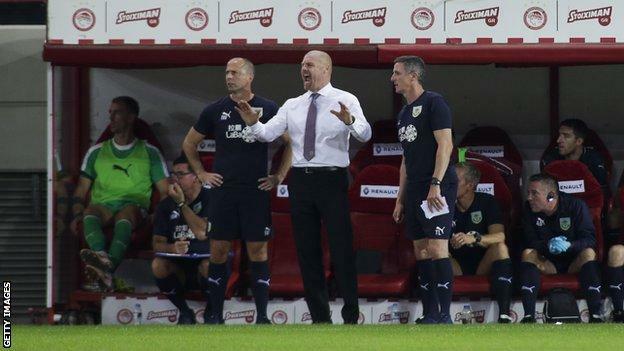 Burnley boss Sean Dyche felt the officials succumbed to pressure from Olympiakos players during his side's 3-1 defeat in the first leg of their Europa League play-off in Athens. The Clarets lost 3-1 in a game that saw their defender Ben Gibson sent off and both sides awarded a penalty. Dyche criticised the conduct of the home team in the tunnel at half-time. "They were waiting for the referee. You all saw the feel of the game was different in the second half," he said. "The scenes I saw at half-time from all and sundry around the referee on their side, you're left scratching your head. "All I keep getting told is respect the officials with your conduct around the referee." The score was 1-1 at the break, with Chris Wood's penalty - awarded after he was pushed over in the box - cancelling out a superb free-kick from home captain Kostas Fortounis. The hosts largely dominated the second half, regaining the lead quickly through Andreas Bouchalakis' header. Gibson received a second yellow card for handling in the box after an hour, midfielder Fortounis scoring the resulting penalty. "For the life of me I don't understand why he's booked Ben Gibson [again]," said Dyche. "The first one maybe but the second one he's gone to block a shot and it's hit his hip, it's hit his hand. How can that be deemed deliberate handball? It's just an impossibility. "Then he gives him the yellow card and it's probably the world record for how quickly he got it out of his pocket, and then gets Ben Gibson sent off." Dyche was also unhappy with the distance the referee asked his players' wall to stand back for the free-kick that opened the scoring. "The wall is a strange distance from the ball, I must say. I've seen that," he added. 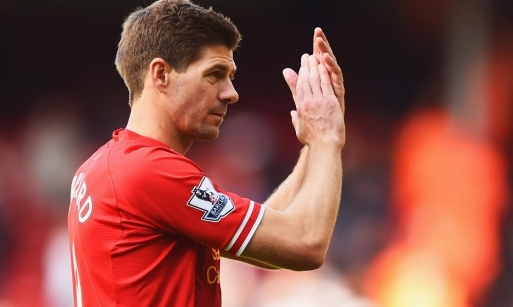 "I feel for our fans, they've come a long way to see a balanced game and haven't seen that. Hopefully next week will be more even." The scoreline leaves Burnley facing a formidable task in the second leg at Turf Moor next Thursday (19:45 BST). Sam Vokes thought he had made the second leg an easier prospect for his side with a tap-in late on but it was ruled out for offside to compound the Clarets' miserable night. Burnley, who went into the game unbeaten in their previous four qualifying games under manager Dyche, have not been in European competition since 1966-67. They beat Turkish side Istanbul Basaksehir and Scottish Premiership runners-up Aberdeen in extra time to set up the tie with Olympiakos. Burnley wore all black, including armbands, in memory of former Northern Ireland forward Jimmy McIlroy who died aged 86 on Monday. 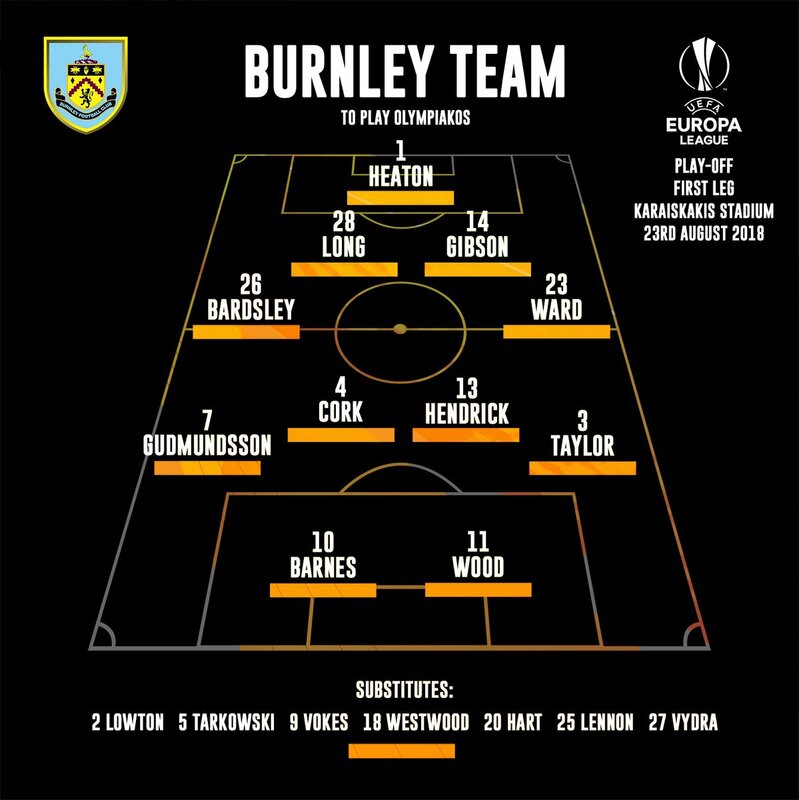 Dyche made six changes in Athens but heavy rotation has done little to aid Burnley's balance of European football and the start of the Premier League season. Long midweek journeys to Aberdeen, Istanbul and Athens have coincided with a failure to pick up a league win. A goalless draw with Southampton came three days after their return from Turkey and they seemed to pay the price for their extra-time victory at Turf Moor the following week with a home defeat by Watford. They will be on the road again on Sunday when they head to Craven Cottage to take on Fulham (16:00 BST) - after playing over half an hour with 10 men in Greece. Dyche clearly had one eye on that game too - taking off key players Wood and Johann Berg Gudmundsson after Olympiakos had put the game to bed. And now the Clarets will have to produce an impressive turnaround at Turf Moor next week - just three days before hosting Premier League runners-up Manchester United.